Download a Free PSD Email Template! It’s Valentine’s Day and because we [HEART] our customers and blog readers we’re giving away a free email template in a fully editable PSD format, available for download for your personal or commercial use. Edit away and have your mobile-optimized template coded and ready to go for your next email campaign. Perfect for advertising your next event. SXSW 2014, anyone? Whether you are in marketing, event planning, or just need to send out a modern email to your mailing list, we’ve got you covered with this free email template – created for marketing and promoting events. We’ve designed a great looking email ready for viewing on all major devices and email clients, whether iOS, Outlook, or Gmail. 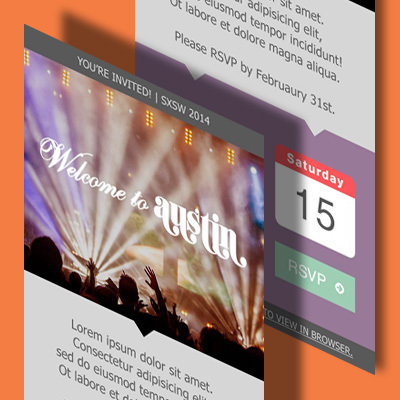 This email template was designed with mobile in mind. As of now, more than half of emails are opened on mobile devices! It’s imperative your email reaches your audience when it’s convenient for them to view and act on it… without compromising the desktop aesthetics. We’ve put great effort into ensuring the CTA button is thumb-clickable, the text is legible, and the imagery makes an impact, all within a minimalist and modern layout. We hope you’ll enjoy editing and using this freebie email template, shared as a fully editable PSD and provided with example markup – we’ve included the HTML for a variation of this template so you can see how this might translate to code. If you need your completed PSD email design converted to code, we can help! Placeholder image used in design is shared under Creative Commons. Source: Unsplash.